Allergic Rhinitis is a group of symptoms associated with the nose and eyes, in which you contract when you breathe in something that you are allergic too. This could be dust, dander, pollen or any other particular. 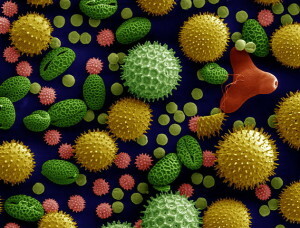 The most common allergic rhinitis is plant pollen, or commonly called, hay fever. The symptoms for any allergic rhinitis are about the same in everyone, however the severity of the symptoms will vary from person to person. The symptoms at fits contact with the allergen are an itchy nose. Some people will have an itchy mouth, eyes throat, skin, and other body parts. Everyone will experience the itchy nose, but some will experience other itchy areas of their body. Most people will have a difficult time smelling, and their nose will constantly be running. 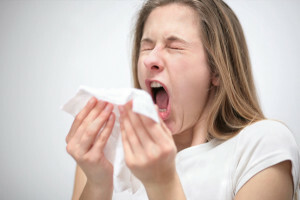 Sneezing is also a very common symptom with hay fever. Tearing eyes is also very common when first exposed to the allergen. If the allergic rhinitis is not treated right away other symptoms may follow. The runny nose will develop into a stuffy nose caused by congestion. A chronic cough may develop as well as plugged ears, and a decrease of hearing and the sense of smell… Some people experience dark circles under their eyes, as well as puffiness. The person may feel tired, and have a lack of energy, and get irritated quite easily due to the discomfort of the allergic rhinitis symptoms. It’s not uncommon that a nagging headache is present, and the person has a hard time concentrating on anything. Memory problems do happen and even slow thinking is common if the person is not treating their hay fever. The cause of allergic rhinitis is when an allergen (a substance that triggers an allergy) is breathed into the nose. The nasal membrane releases histamine toward off the allergy. The body attempts to remove the allergen by releasing the histamines, thus causing the allergy symptoms, such as itching , swelling of the eyes and throat and mucous production causing coughing , runny nose, and later congestion. The allergens that trigger allergic rhinitis vary from person to person, and where the person lives plays a role as well. Large areas of pollen that are visible are usually not the reason for hay fever. The hard to see particles that can be breathed through the nose, are the main cause for hay fever symptoms. The most common plants that’s trigger hay fever are deciduous, and evergreen trees, ally types of grass, and ragweed. Hot and dry days tend to be the worst formula to trigger hay fever symptoms. Cooler rainy days tend to be less severe because the rain and cool weather lowers the level of pollen in the air. The more pollen floating in the air the more hay fever symptoms rise. The only way to find out of you have hay fever, or another allergy is to have a physical exam by a doctor. They also will need to know if you have a history of allergies in your family because there is evidence that allergies are genetic to a certain degree. It’s important that you have a history of your symptoms such as the time of year you experience them, your diet, and your exposure to certain animals, or plants. Certain blood test can reveal certain allergy possibilities Sometime skin tests are performed where a small amount of tissue is injected with trace amounts of allergens, to see if it will react negatively.